We loved everything and would absolutely stay here again. The staff, the views, the facilities, proximity to town, everything was fantastic. Friendly staff. Very good beds. Every day different things on the breakfast table. Excellent positionering, Nice view from thé room. Lots of privacy. The staff was so friendly and accommodating. The breakfast buffet was superb as well. The view of Naoussa from our room, the lobby, and pool was the most beautiful. I absolutely would come back!! The owner and staff were very attentive and professional . Chrys the owner went out of her way to accommodate us. The rooms we had were very well appointed with mini fridge and microwave . The breakfast was over the top delicious and had a great variety of local foods. The view of the port was very quaint ; and the location was ideal - 7 minute walk to Naousa town -the best town on the island. We also liked the roof top lounge in the evenings. Kris and the rest of the staff has been amazing. We had an injury in the group that left one of us in a cast and hotelbound. The while staff helped take care of our injured group member in order to give us time to explore the island. Breakfast was amazing every morning. Our room was spotlessly clean and comfortable. The hotel is an easy walk to everything and we fell in love with Naoussa. Highly recommend! The staff was INCREDIBLY welcoming, and the breakfast was delicious. A great short walk to town. The room came with a breakfast included. It was wonderful with fresh fruit and many wonderful choices. You name it they had it. Great hotel, great location and great staff! Can't wait to stay here again. I'm recommending it to everyone! Lock in a great price for Paliomylos Spa Hotel – rated 9.4 by recent guests! Paliomylos Spa Hotel This rating is a reflection of how the property compares to the industry standard when it comes to price, facilities and services available. It's based on a self-evaluation by the property. Use this rating to help choose your stay! Located 2,650 feet from the lively town of Naousa, Paliomylos Spa Hotel offers a swimming pool with sun terrace overlooking the Aegean Sea. It features self-catering accommodations with free Wi-Fi access. Paliomylos rooms are elegantly decorated and air conditioned. They all have a kitchen or kitchenette, and a balcony. A TV is standard. Some rooms also include a living area. Guests can start their day with a buffet breakfast. Later in the day, they can enjoy a drink at the hotel’s bar featuring stone walls and wooden beamed ceilings. Paliomylos Spa Hotel includes an indoor salt-water hot tub. A variety of massage and beauty treatments by experienced therapists can be arranged upon request. Paros Airport is 16 mi from Paliomylos Spa Hotel, while the port is at 6.2 mi. Within 328 feet, guests can find a super market and a bus stop. 뀐 Located in the top-rated area in Naousa, this property has an excellent location score of 9.5! When would you like to stay at Paliomylos Spa Hotel? Air-conditioned studio featuring a kitchenette and TV. 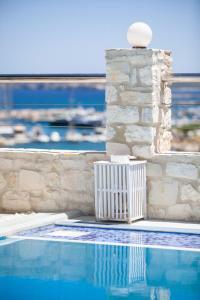 It is located on the pool level and opens to a terrace with Naousa Bay views. Air-conditioned studio with a kitchenette, flat-screen TV, Istikbal beds and its own balcony with pool and sea views. This air-conditioned suite has 1 separate bedroom with Istikibal beds and a lounge area with a kitchenette and a flat screen TV. It opens out to its own balcony with sea views. This modern suite has a dining area with kitchenette, 2 bedrooms with Istikbal beds, air conditioning, a flat-screen TV, and offers sea view from its balcony. This modern, 2-bedroom suite features 2 bathrooms, a living area and a veranda with Naousa Bay or town views. Modern, air-conditioned room featuring with a fridge, flat-screen TV and a modern bathroom with shower. Please note that this room type has no balcony, it offers a window with inner courtyard views. This modern studio features a kitchenette, air conditioning and a flat-screen TV. It opens out to its own balcony with panoramic Naousa Bay views. 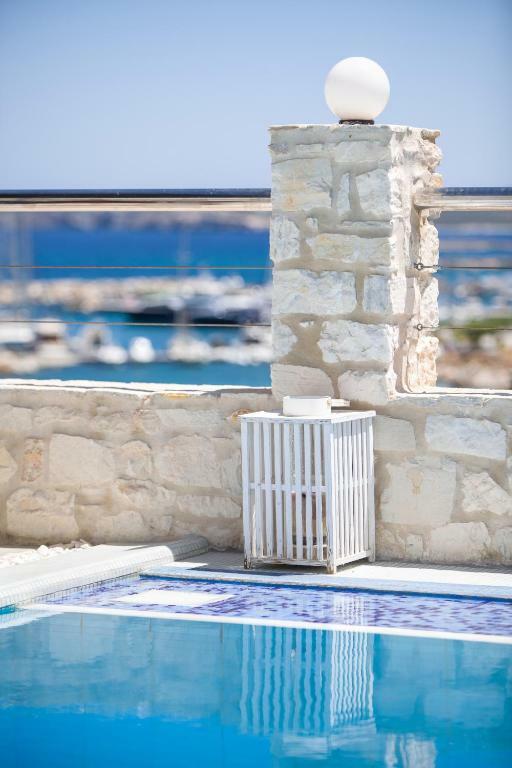 This modern suite opens to a furnished balcony offering panoramic views of Naousa Bay. It includes bedding by Istikbal, lounge area, kitchenette, and bathroom with free toiletries. This modern suite has 2 separate bedrooms, bathroom and 2 balconies with panoramic views of Naousa Bay. This air-conditioned suite has a separate bedroom with Istikbal beds, a lounge area with a kitchenette, and a flat screen TV. It opens out to a private balcony with town view. Our property is cared for; with tender love and care. We believe that you deserve the holiday you have planned and we are here to help you make that a reality as best as we can. We thoroughly enjoy what we do and hope that you will also enjoy Paliomylos. We have renovated this hotel since 2000 and keep renovating every year to keep up with standards. We learn from the thousands of guests that come by each season and we look forward to showing you the real Paros, of course Naousa. Besides being a hotelier which I love, I am also a visual artist. Painting is my passion and have been a professional since 2008. My exhibitions have taken me around the world, I still have so much to do. I also enjoy a good cocktail, an amazing delicious dinner and a good conversation. Our neighbourhood which is just 700m from the main town of Naousa, is the Piperi beach area. At Piperi you can go and sit on the cliffs and enjoy the view. If you are lucky and we have a really clear day you can see Mykonos across the bay and the archeological island Delos. You can walk along the cliffs from piperi beach to small piperi beach, there are paths made by walkers. Along the way you will see some great houses too. House Rules Paliomylos Spa Hotel takes special requests – add in the next step! Paliomylos Spa Hotel accepts these cards and reserves the right to temporarily hold an amount prior to arrival. Please note that guests are offered discounted prices at the spa center (discounts vary depending on the spa treatment). A damage deposit of EUR 150 is required on arrival. That's about 168.11USD. This will be collected by credit card. You should be reimbursed on check-out. Your deposit will be refunded in full by credit card, subject to an inspection of the property. Nothing was wrong at all. Absolutely nothing. Everything was perfect. Loved everything! The Australian Owner/Manager was super friendly, nothing was too much trouble, including arranging a rental car to be delivered to the hotel. We booked the triple room, even though just for the two of us, as we don't like small rooms and when we arrived the pullout couch was made up as a bed as they weren't sure. They put it back to a couch immediately when they realised it was just the two of us. Our bed was extremely comfortable (sometimes in Europe they are a bit firm). So I can't comment on a double room but the triple was perfect. Lovely balcony overlooking the pool and with views of the town opposite. Palio is just a short and pleasant walk to the lovely town. The pool was great, perfect temperature for the hot days. There is a bar at the hotel so drink service also available around the pool. Breakfast was amazing. A huge choice of hot and cold food. My husband thought the breakfast room was a bit crowded - tables all a bit close - but it didn't bother me. We had a wonderful stay, loved Paliomylos and the town of Naousa and hope to be back one day! Staff are extremely helpful and easy to talk to. An amazing hotel to stay at, everything was accessible easily and breakfast was delicious. The best hotel we've stayed at so far! I absolutely loved the feel of being just a short distance from the town but remain in the the village It’s was beautiful and quite and the proprietor was so accommodating and warm. Great size rooms, tasty food, beautiful pool, fantastic location with a short stroll into town. Staff were extremely accomodating for anything we needed. We also had massages at the spa which were so relaxing and would highly recommend. We absolutely loved Paliomylos spa hotel. The location was great, a ten min walk into the town which was perfect. A two min walk to the beach. The pool area was beautiful and everything was kept so well. Really clean, very stylish. In fact - the photos don’t really do it justice! The staff were all lovely and polite and the owners were great! Delicious breakfast with different cooked options each day. Great cocktails. We were in a room without a view as it was the last room available, but it was still delightful. We will definitely be coming back to Paros, and will undoubtedly stay at Paliomylos! location is great! Very close to the town center and right down the hotel is a beautiful beach! We loved it so much! And we love the style of the hotel and the room! Everything is just wonderful! The hotel is beautiful in an ideal location. The room was clean and crisp with the most comfortable bed and the bathroom shower was large with gorgeous mosaic tiles. The towels were washed with the most lovely smelling soap that made you want to smell the towel over and over again. It’s those little things that really make a big difference. The pool was amazing with gorgeous views of Náousa and the breakfast was delicious with a very good assortment of food with traditional Greek pies and hot food that changed on a daily basis. Chrys and her team were the real gems of this stay. Chrys was extremely helpful and professional, and she assisted us in finding a hire car at the last minute in peak season. We are very grateful for all her advice and tips on where to go and places to see. We will definitely stay here again when we return to Páros. A most amazing stay!